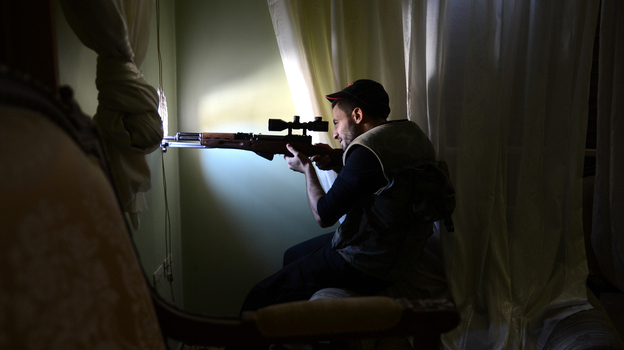 A Syrian rebel fighter takes aim at government forces from an apartment in the northern city of Aleppo on Saturday. While the fighting rages, the Syrian opposition is holding talks in Qatar in an attempt to create a new, more unified front. The U.S. announced last week that it favors an overhaul of the opposition leadership. Could a united Syrian opposition be the game changer that finally topples President Bashar Assad, after almost 20 months of revolt and more than 30,000 dead? "You need a game changer, either military or political, and hope it will break the stalemate," says Amr Azm, a Syrian-born professor at Shawnee State University in Ohio. The Obama administration appears to embrace this view, and last week Secretary of State Hillary Clinton made the surprise announcement that the U.S. backed a plan to overhaul the Syrian opposition. Hundreds of Syrian dissidents began five days of intense talks Sunday in Doha, Qatar. Clinton added urgency by also withdrawing support for the Syrian National Council, the exile-led group that has claimed to represent Syria's revolution for more than a year. The SNC is widely seen as dysfunctional and has lost legitimacy with young activists as well as front-line militias. The group also has failed to convince Syria's minorities that it is a credible political alternative to Assad, who has ruled the country for 12 years, succeeding his father, who was in power for three decades. The so-called makeover meeting in Qatar got off to a rocky start Sunday as U.S. hopes clashed with the reality of fractious opposition politics. Divisions quickly emerged. SNC leaders complained about a reduced role; Islamists disagreed with secularists; young activists charged that longtime exiles are out of touch. And the goal to build an alternative leadership could be infected with the same "virus" that sunk unity within the SNC, says Randa Slim, with the New America Foundation. 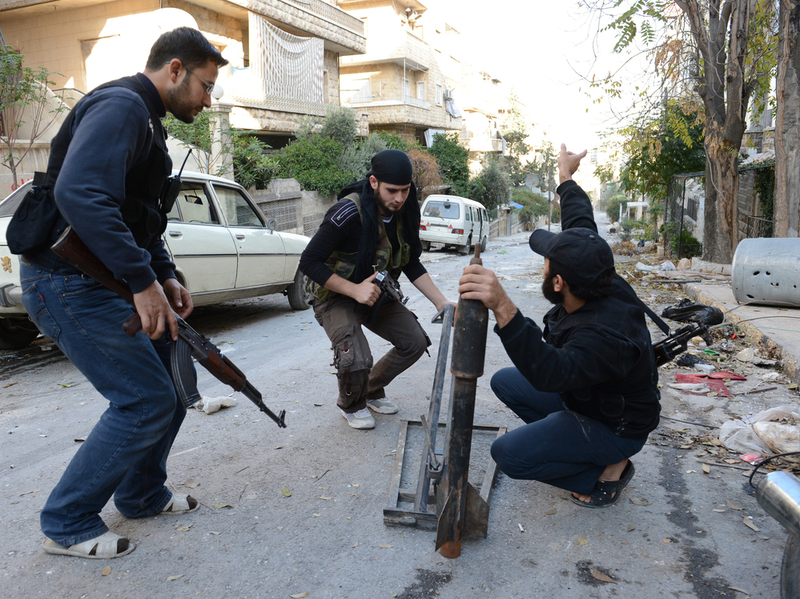 Syrian rebel fighters prepare to launch a rocket in the northern city of Aleppo on Saturday. The rebels say they have launched a major assault on a government air base in northern Syria. "The demise of the SNC is a result of self-inflicted wounds," says Slim. Syrians are "fed up" with the SNC, she says, but that doesn't make it easier to quickly create a credible alternative. "Their intuitive reaction is mistrust," says Slim, especially with the call for a major overhaul coming from the Americans. However, the plan for a leadership shake-up came from a widely respected Damascus dissident, Riad Seif. The 66-year-old is a former member of parliament and was also jailed by the government. He comes from the Sunni business class. Slim says he has broad-based connections and "brings to the table leadership skills and credibility." Seif led a group of 20 opposition figures in Amman, Jordan, ahead of the Qatar talks to hammer out the details of a new leadership group that would consist of about 50 members. Called the Syrian National Initiative, the council would include many young activists who have played an important role on the ground in Syria's revolt. The new body would then choose a 10-member executive council as early as this week. "The goal is to appoint a group of technocrats as a transitional government," says Amr Azm, which could set the stage for support from the Arab League and international recognition. In Qatar, Seif dismissed speculation that he would lead a transitional government. He's been diagnosed with prostate cancer and told Agence France-Presse in an interview, "I am 66 and have health problems." You need a game changer, either military or political, and hope it will break the stalemate. He said an alternative government to Assad's regime is "dearly needed," to secure more foreign aid and international support. Seif, a longtime opponent of the Assad regime, joined peaceful street protests in the capital, Damascus, early in the revolt that began in March 2011. He was beaten and arrested in the capital with hundreds of young activists. "He realizes that the young people are dominant," says Andrew Tabler, with the Washington Institute for Near East Policy. "He's an inside guy who has street cred." Tabler believes that activists from the provincial and revolutionary councils in Syria should have been given leadership positions a long time ago. Tabler also cautions that opposition politics are splintered in Syria, and that won't change anytime soon. For the Obama administration, shifting the generational power balance appears to be one selling point for a new opposition leadership. In addition, there are the changes that have taken place on the ground. This summer, rebel militias seized control of large areas across northern Syria. The U.S. has been giving nonlethal aid to the opposition, including training programs conducted in Istanbul and in southern Turkey, a $6 million program geared for activists coming out of Syria. The first group included 36 activists, members of revolutionary councils from the northern province of Aleppo. Later groups came from Idlib in the northwest and Deir el Zour, a rebel held area near the Iraqi border. The intense course work focused on helping the Syrian opposition set up administrations in towns and villages. For the first time, U.S. officials met face to face with young activists creating grass-roots representative bodies that provide humanitarian services and a fledgling judiciary. The French government has gone even further by directly distributing cash to revolutionary councils under rebel control. "There has to be a representation of those who are on the front lines, fighting and dying today to obtain their freedom," Clinton said. "And we also need an opposition that will be on the record strongly resisting the efforts by extremists to hijack the Syrian revolution." However, those doing the fighting and the dying are the rebel militias, but they have not been invited to the Qatar meeting. "That's an important thing that's missing," says Tabler. "The big problem in this is not engaging armed groups directly. Those taking the shots will be calling the shots, at least in the interim." But the Obama administration has become increasingly concerned about the radicalization of the militias. The U.S.-backed political initiative is an attempt to empower secular civilians who would have stronger links with commanders on the ground. Over the past 20 months, the Syrian revolt has become a grinding military contest. Militia leaders concede that radicals, including some who share the ideology of al-Qaida, are well-trained and well-armed by a network of private funders, and are crucial to the rebels' campaign. "Until the opposition can hold a major city, they can't create an alternative Syria," says Joe Holliday, a senior research analyst at the Institute for the Study of War.